» Forum » All Pinball » Hardest Shot in Pinball? » Hardest Shot in Pinball? I’m trying a little something different with my Top 5 list on The Pinball Players Podcast. Instead of me coming up with the list, I’m asking players to give their answer on a topic. I’ll count the results and the 5 most popular responses will make up the list to be announced on the next episode. I find the Gem shot in Tron to be pretty hard to find. I can pretty much never hit the left orbit on WOZ that goes through the pops intentionally. Not sure if it's the angle on it or what, but that thing feels impossible when I'm trying to hit it. There's lots of other hard shots in pinball but that one takes the cake for me. Hitting the extra ball target on Fish Tales is not that easy... at least for me. The Jet Stream on Supersonic with a fresh set of rubbers. Hitting the extra ball target on Fish Tales is not that easy. It's extremely easy if you backhand it from the right flipper. Don't waste your time trying with the left. The hardest shot in pinball that I know from all the games I have ever played is on Maverick, the captive ball under the Lauren Bell. Nothing feeds the shot to the upper right flipper well, the only way you can even try to shoot it is off a full speed orbit from the left orbit. This shot is so valuable, but so small and difficult. I'm not talking about a shot you only hit once or twice a game difficult. I've gotten to the Poker Championship wizard mode, scored over 4.4 billion on it and owned Maverick for years and I think I probably only hit it a handful of times. If you don't think this shot is the most difficult, then you probably haven't played Maverick or tried shooting for it if you did. I guess it depends on how your flippers are set up. Back hand on mine is still difficult. Getting the "Dirty Pool" shot on Addams is tough. Only done it a couple times in 16+ years. While I agree with some mentioned above. The captive ball jackpot shot under the boat in Maverick is quite tricky. Backhand from the right flipper, piece of cake. Whichever one is lit for the biggest reward. Tales from the crypt right ramp. I agree with the GEM shot. Another really tough one is the milkcan on Houdini. The one I need to make most at any given time. This one is understated. I don't know how many times I hit this and just don't have enough steam to get the ball up. I like a challenge but this is sort of a design flaw. If anyone has played Cheetah. That skinny left lane is a doozie! How bout Surfer for an EM. When you have all your saucer lights lit, it's impossible to get into that saucer! WH20 Extra ball shot.- Mostly because it's a sucker shot that leads to a SDTM drain. Hitting the IJ Mode shot when a Cliffy is installed. - bounce out city! That's easy.......whichever shot I have to hit next during league play for me to win the match!!!! Last Tuesday it was the right ramp on AC/DC Pro with Jam & Album MB both lit!!!! I was beating the hell out of the to lightning targets, and when I finally got it going up the ramp, it wasn't strong enough and came back SDTM!!!!!! AAARRRRGGGHHH!!! SIM card on Dialed in. WCS94 TV scoop hole shot. I concur with previous votes for the Gem shot in Tron. That’s also what makes Tron such an awesome game. Due to placement of a post you can’t really hit it with the upper flipper unless the ball dribbles some separation from the ball glide, which is hard to achieve. So it takes bizarre alternate strategies to make it. My play is a billiards bounce off of the drop targets to purposefully target Gem, with an accuracy of about 10 wasted shots per actual hit. There are plunge strategies which are lower percentage and some luck from a multiball ricochet. Yeah I saw that from 3 years ago and another from 6 years ago, but thought it was time for a fresh take with new games to choose from since then. 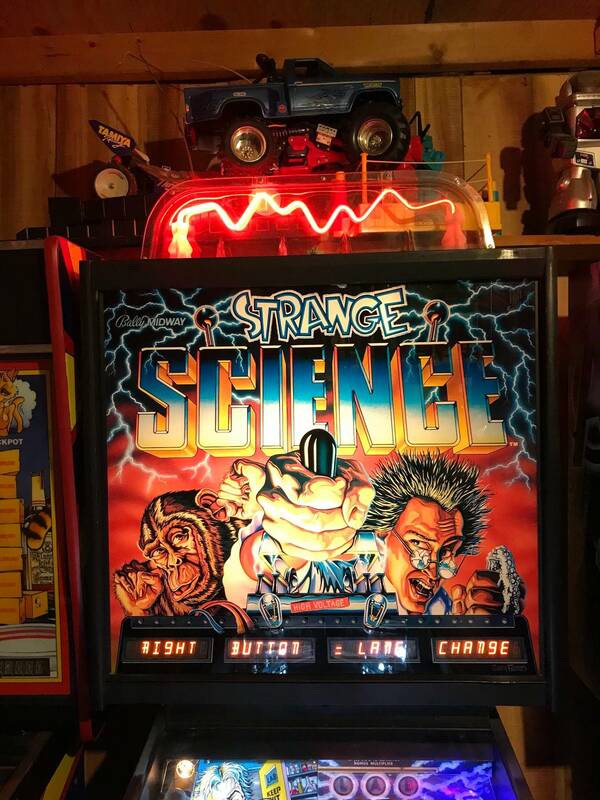 Knocking out the captive ball on strange science when there’s only one loaded. My game can do it but it has to be perfect. How about shot I have at getting approval from my wife to buy another pinball machine? Mode start shot on The Shadow. Houdini .... Ball lock to catapult , under the milkcan on the left . And when a mode is engaged any shot to get it ! And time for a fresh batch of clever "the shot I need to make" responses, I see! Professor X shot on my x-men pro. Any shot that has Tequila in it. That stuff is NOT the aiming fluid they said it would be.